Thanks for your interest in My Cake School!! Now, let’s jump ahead about 13 ish years….. This is me sleeping with my eyes opened! (I really am.) –Let me take this moment to tell you NOT to make this many cakes all at once. Bad idea! 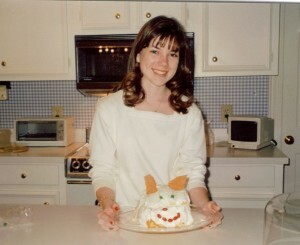 I ran my cake business from home for several years, running on no sleep, and sleeping at inappropriate times (that could be a post all by itself! )…but I wouldn’t trade that experience for anything. I loved the creative outlet, the excitement of coming up with new designs–and I loved being a part of so many celebrations!! About five years ago, I decided to take my cake life in a different direction. I wanted to teach decorating, but wanted some flexibility in my schedule. I wanted to cover lots of techniques too…and to teach however I wanted. I also knew that there were lots of cakers and potential cake decorators out there who would love to take a class or two if only they could find the time! 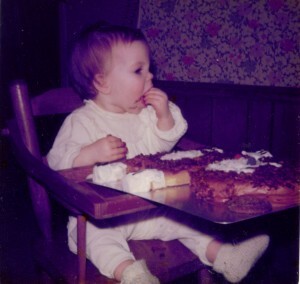 That’s when the idea of My Cake School was born! Cake videos and conversations on caking are available around the clock–all you have to do is turn on the computer! We post weekly tutorials in the blog, which are open to everyone…or you can become a member of our site and access ALL of our videos, forums, and recipes! And all while in your pajamas :0) What could be better? I hope that you enjoy the site— let’s talk cake! @Sarah Edwards- I’m sorry that I missed your comment earlier! Memberships are $30/year. We would love to have you as a member! Our Recipes section is already available to non-members, but as a member you would have access to every cake video we’ve made! @Monica- Thanks for your interest in My Cake School! If you are interested in learning more about scratch baking, we have a couple of baking videos in our Free Cake Tutorials Section – One is “How to Make a Cake from Start to Finish (using the conventional method of mixing)” and the other is on the Reverse Creaming Method of mixing. These are helpful in covering the basics on following a scratch cake recipe. 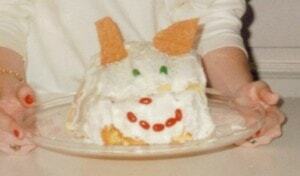 In our Recipes section, we have lots of scratch cake recipes as well as doctored cake mix recipes. As for cake decorating, we cover everything from the very basics to more advanced techniques in fondant, gum paste, buttercream, etc. – You can click on our Videos tab on the home page to see a listing of the different videos that are available to our members. The majority of our videos do not require special tools…and there are always alternative decorating methods to fit what you have available to you. I hope this helps! I am impressed, I must say. Any additional suggestions or hints? I�m shocked at how fast your write up loaded on my cell phone. Your post is absolutely on point! Love this cake! If I mention your website, can I post an image on my Alice’s Table Instagram? Hi I just saw your webiste and I liked it and want to become member so whated to know the $30 membership will cover what during the year? Hi Laily, Thank you for your interest in the site. As a member you will have access to all of our videos, I have lost count but I think we have around 300. You can watch these videos as many times as you like during your time as a member. You can also participate on our Forum where members post questions and communicate with other members. 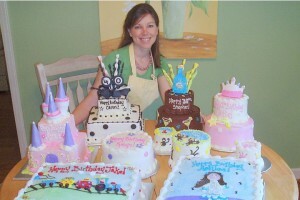 If you log onto mycakeschool.com now you can click on Video Tutorials and see pictures of all of the videos on the site. Our recipe section is open to all. Let us know if you have other questions. Hi Melissa…. can i add yellow food color to your yellow cake recipe to make the cake look yellow? My cake doesnt look yellow like your picture. Hi Rena, Yes, it will be fine to add a touch of yellow to the cake batter. Hi Sammy, Thank you for your interest in the site. We would be happy to have you join. Please visit our home page at mycakeschool.com and click on the join button (top right corner). There you will find more information about the site and joining info. Let us know if you have other questions. Hey Melissa, It has been awhile since I contacted you so how are you? Hey I cannot seem to find the printable recipe for the Peanut Butter and Chocolate Cake. Can you, will you please help me out here? Hi Melissa I will like to know if the videos can be downloaded so I can watch online to avoid data usage all the time. Hi Deola- I’m sorry, our videos are just for watching online but not downloading. Melissa, I really need to learn the technique of smoothing buttercream to look professional. I use the viva paper towel method but somehow my cakes doesnt look as smooth and professional as yours. Is there something in your membership package that can help me with that? On the flip side side, I would like to know if I can substitute buttermilk with coconut milk in your Italian cream cake.